What's the Difference Between Tax Exemptions and Tax Deductions? Two years ago, our tax preparer suggested we take advantage of tax breaks like IRAs and home ownership. We then looked at our options and started working on our IRAs. Buying a house just for a tax break wasn’t what we wanted, so we paid down our debt and saved some money on the side for our upcoming town house purchase. We did, however, realize that we needed to be more informed when it comes to taxes, and to (legally) maximize any tax breaks we can get. If you’ve read much about taxes, you’ll no doubt have seen the terms “exemption” and “deduction.” Today, I’m going to talk a bit about what these terms mean, and why they matter. First off, exemptions and reductions both reduce your taxable income, which is a good thing. Exemptions are specified amounts by which you reduce your taxable income — just for being you! For 2009, federal income tax exemptions (either personal or for dependents) are $3, 650 each. There are adjusted gross income (AGI) limits beyond which the exemptions are phased out. The specific limits vary depending on your filing status. 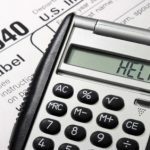 Income tax deductions, on the other hand, are actual expenses that you’ve paid during the tax year that you can claim against your taxable income. Some examples of expenses you can deduct are alimony, moving expenses, and charitable contributions. As you may know, you can claim one exemption for yourself as long as you’re not claimed a dependent on someone else’s taxes. You can also claim an exemption for your spouse if you file a joint return. Age: Are they 18 or under? If they are a full time student, that increases to 23 or under. Relationship: They should be a member of your family such as your child, stepchild, sibling, or decedent of any of them. Support: The child cannot provide more than half of their own support. Residency: The child being claimed must have lived with your for the majority of the year, with some exceptions. Special test: Only one person can claim a qualifying child. You can’t divide the tax exemption. The IRS has rules to determine who gets the exemption if the parents can’t agree. Not a qualifying child: This simply means they can’t fall under the qualifying child rules if you are to claim the relative exemption. Member of household/family member: This is a residency based test to determine if they’re a member of your household. In some cases, such as relationships created by marriage, the relative may not have to live with you to qualify. Check with IRS Publication 501 for more details. Gross Income: The qualifying relative must have less than $3, 500 in gross income during the tax year. Support: You have to provide more than half their total support. There are special rules if multiple people contribute more than 50% of the total support in aggregate, but no one individual does so. Be honest with your answers and you’ll be able to claim the exemptions to which you’re legally entitled. When it comes to income tax deductions, you can either claim the so-called standard deduction, or you can itemize your deductions. You cannot do both. Obviously, you should choose the option that results in a lower tax bill. I’ve done my best to ensure that the above listed amounts are current (for tax year 2009), but you should always double-check to make sure that you’re working with valid information. You should also check with the IRS itself, or a qualified tax professional, to get answers relevant to your specific circumstances. With that said, I’m curious to see how many of you file your own taxes. We did it ourselves last year, and we’re plan on doing it again this upcoming tax season. Thank you, thank you for the information. This information about the difference between exemptions and deductions is something I wasn’t really familiar with, but knowing it now makes it a million times easier to understand my tax responsibility. We use TaxAct. It’s online and very cheap, and we save pdfs of all of the returns. We itemize. It took me about 30 minutes last year and we got our refunds so quickly. Thanks for the info. I’ll be checking this again when I begin to prepare my taxes. It’s always more complicated that I remember! Patty, thanks for your thoughts. It really seems like the magical number to earn is $199,999 for single filers. @1 Financial Samuria – the number is chosen after it is scored by, example the GAO. The number is selected as the phase out so that it will generate a higher tax for the govt and allows the government to raise tax revenue without changing the tax rates. I file my own taxes have for years – though I also file about 150 additional returns for my clients. Nice explanation on the exemptions and deductions. Lastly, learn what you need to get the lowest tax. Every extra dollar paid to the government that isn’t necessary, is a dollar less wealth you will accumulate. I’m surprised by how interesting taxes can be when it’s your money. It’s not my favorite topic, but I’m really reading up on it. I do my own. I could probably get away with the 1040-EZ, but you can’t claim student loan interest or Hope/Lifelong/American Opportunity education credits on them. Since we’re not married, and my partner makes a lot more money than I do, my taxes are really simple, 1040EZ and a pencil. His are complex and some years he’s gotten hit with the Alternative Minimum Tax. I keep trying to get him to let me set up an Excel sheet so he can try out different options & see what they look like, but he likes his graph paper & pencil, so he does that. I get all the paperwork together (and these days, print out all the online receipts for charitable donations) to make it easier. We’ve always filed our own taxes. About 4 years ago, we stopped doing it manually. My wife is a CPA and her work focuses on tax issues, so she bought a program and uses it for our tax filing now. As a new employee with the Department of the Treasury, she can’t do others’ tax returns for profit anymore. As for the deductions you take, be very careful to keep good documentation on how you arrived at them! In the event that you are asked to verify your claims (it happened to us), those records will save your hide. Very informative post Nickel! Do you think it’s kinda silly that deductions phase out after one makes $166,000 as a single person? How did they come up with that number? Why not $153,000 or $188,000? It seems inconsistent, especially with our US tax policy going up for those making $200,000 or more.